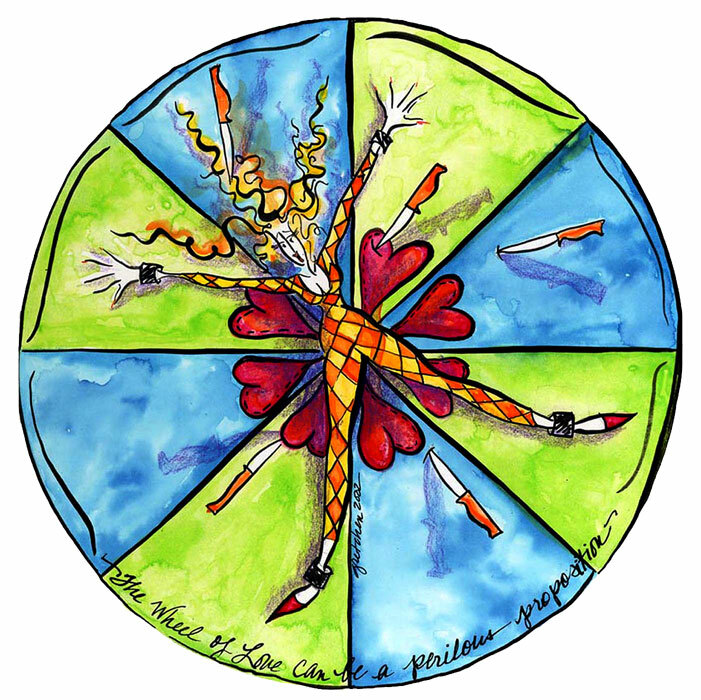 Art a la Carte project menu – 2016 spring & early summer update! But not to you! I’m still here, but it’s time for Pink Lady to move on. 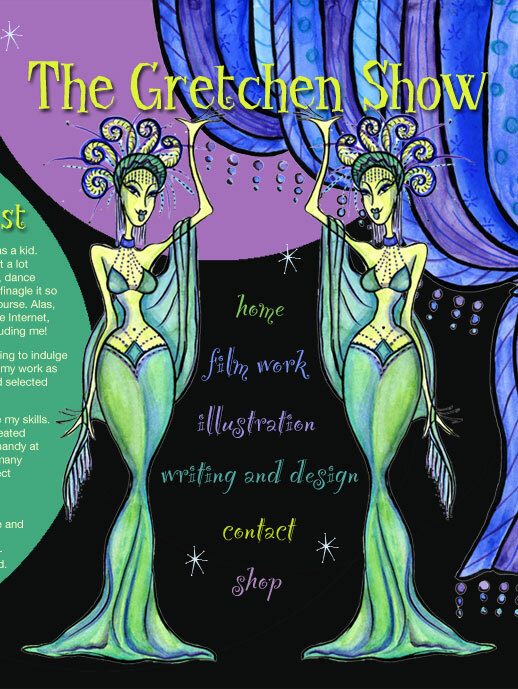 She has been the welcome hostess on my original web site, The Gretchen Show, since I began it over seven years ago. It was my very first web ‘presence’ as an artist and, although now woefully out-of-date, I am still very fond of the levitating pink me, welcoming visitors to step inside. Also retiring are the Green Girls, those tireless showgirls who have been holding up my marquee for so long. The Gretchen Show is long overdue a revamp and I’ll begin making that transition this weekend, but thought these three cool chicks deserved one last encore. 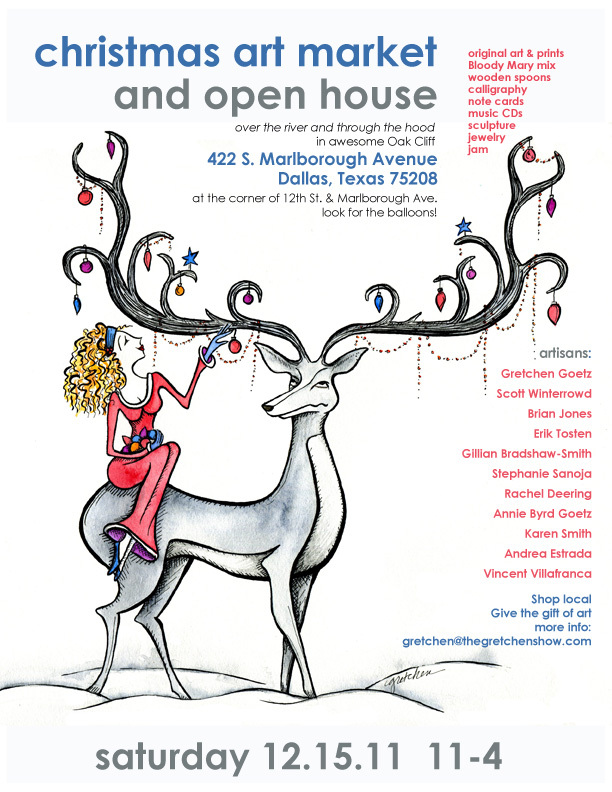 So pop over if you want to catch their last performance – before the curtain rises on a new Gretchen Show. Adieu and many thanks, Pink Lady! Farewell, Green Girls! 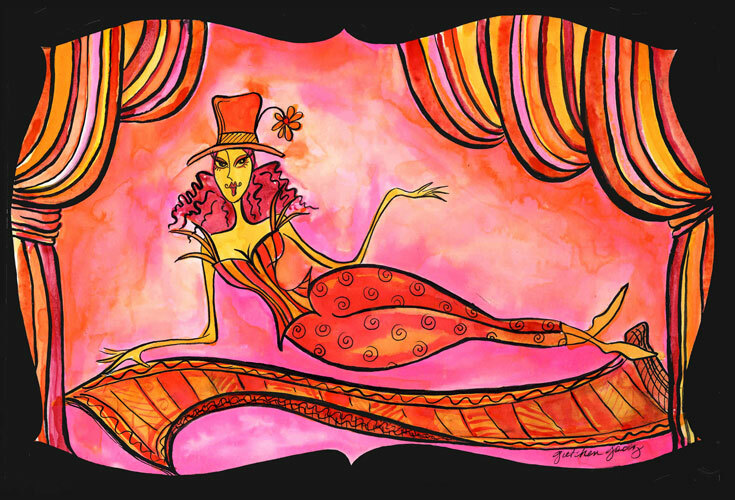 This week’s topic on Illustration Friday is talent. 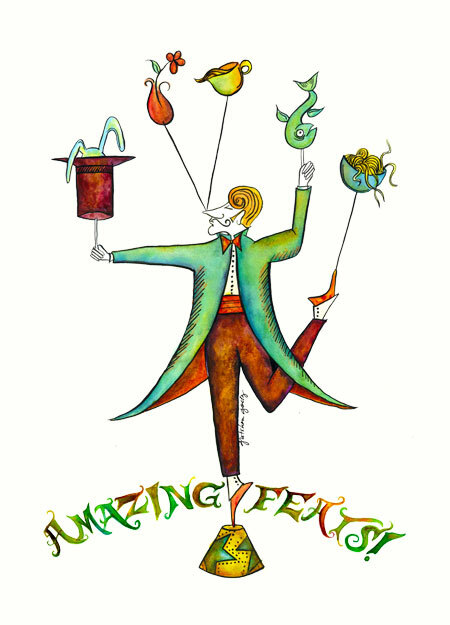 I’ve got a few works that would fit that bill, but I’m especially fond of Amazing Feats, a piece I created a few years ago for a self-promotional postcard. Multi-tasking with élan! …I was going to say ‘a crap shoot’ but that would be mixing literary and visual metaphors. But it sure can be perilous. As you might guess, I have ambivalent feelings about Valentine’s Day. Could be because my fortune in spinning the wheel in recent years has been a little spotty. Like J. Geils, I’ve had the blues the reds and the pinks. It’s one of the sad facts of life that, sometimes, ‘this thing they call love it’s gonna make you cry”. Still, I hope your Valentine’s Day is a sweet one! 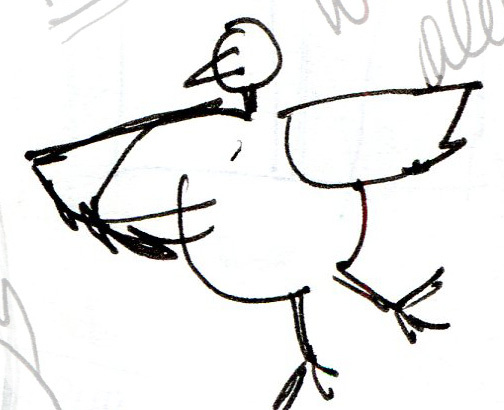 For a more somber look at the perils of love, visit my illustrated memoir. 52at52 will remain the working title for the time being until I decide on a name more appropriate to the content. I plan to regenerate the 52 weeks of self-portraits project on my 52nd birthday in May. I’ll keep you posted. I thought it would be nice to have a little commemorative artwork for my twitter inauguration. I’ve resisted tweeting, but, after following a few folks for a couple of months, have realized it’s a pretty cool platform for sharing and exchanging information quickly and efficiently. So I’m going to try it out. If you’re a twitterer, please look for me @gretchenartiste. If you have any twitter words of wisdom you’d like to share, please do! I don’t really know the tweeting world protocol and would like to make as few missteps as possible. You can use the comment box at the bottom of this post – or shoot, tweet’em to me. I will be keeping my art page on FB so pop on over there if you haven’t already. I like the social atmosphere of Facebook. I’ll be rolling out my current art project, an illustrated memoir of thwarted love (for now in blog form), in the next couple of days. Very soon! I’ll do an initial post about it here, but will post more frequent updates on it and all my other arty stuff on twitter. 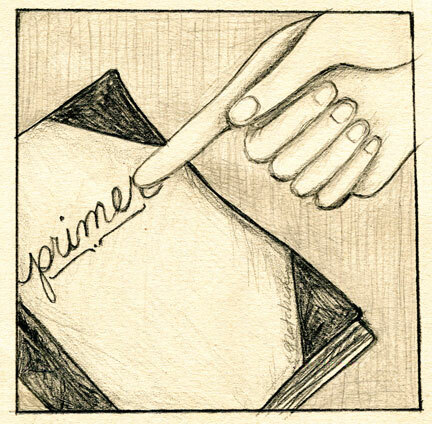 I also have been working on a new creative project: an illustrated memoir of a thwarted love. It’s a very personal work of art, intended to be viewed as it progresses, so the blog platform is ideal. I have a few more tweaks to make on it, but hope to share it with you in the next week or so. In the meantime, here is a little visual bon mot from the art giveaway game we played on The Gretchen Show over on FB during Christmas. I called it A Sketchbook Christmas. 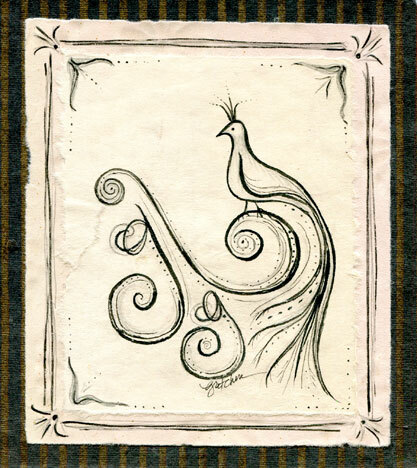 The idea was to rewrite The Twelve Days of Christmas using images from my sketchbook as inspiration. I invited followers to suggest lines to accompany the sketches and then created more polished B&W drawings for the winning selections. We only got through the first six days – we’ll finish the second half next Christmas – but it was a lot of fun and there were some great submissions. 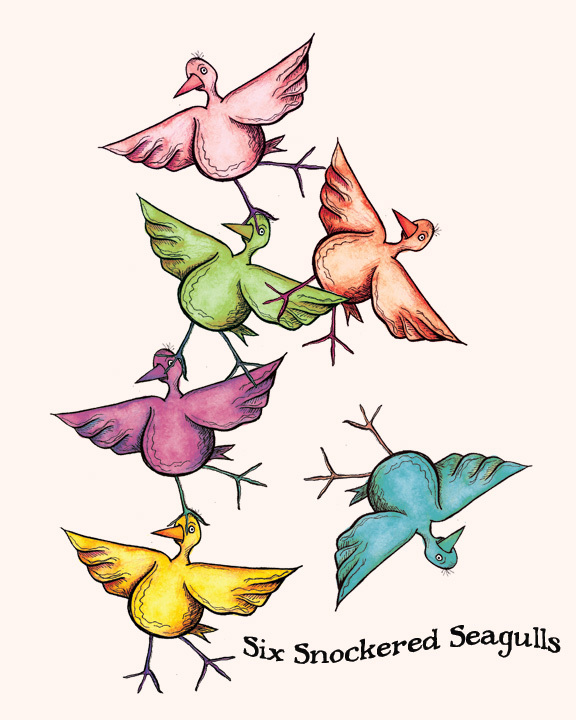 One of my favorites was the winning line for the sixth day, Six Snockered Seagulls. Myself and a bunch of my artist friends are gathering again this year at my home for a cozy Christmas art market on Saturday, December 15th. We’d love to see you! More details and artist lineup can be viewed here. It’s been an incredibly busy autumn for me, thus I’ve been slack on posting. 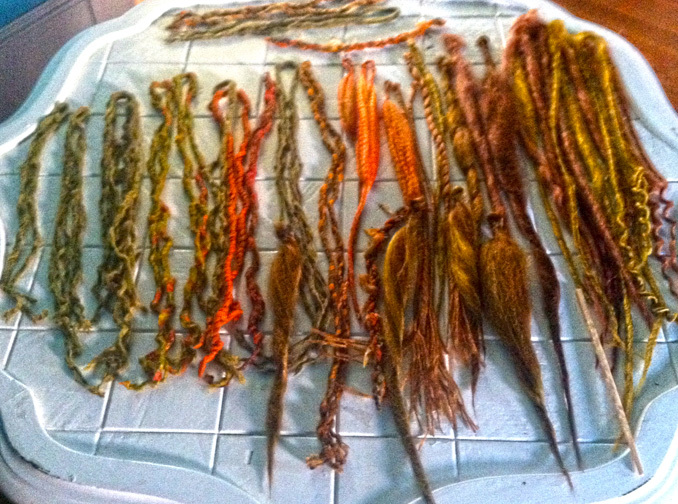 So here is a quick round-up of some things I’ve had a hand in that are now in full bloom. This is the fourth year I’ve done the artwork for Theatre Britain’s annual Christmas panto. 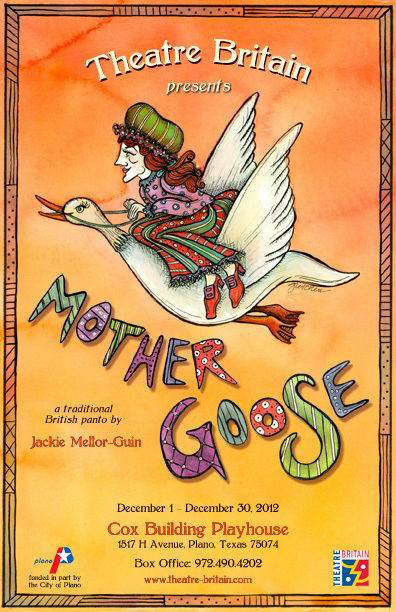 This year’s performance is Mother Goose. If you are in the DFW area, this is a wonderful family outing. The interactive theatre experience is fun for adults and kids; and the sometimes saucy double entendre dialogue adds extra laughs for older audience members. This year’s run is from Dec. 1 – 30. Check their website for more details. Go here to see art from past years. 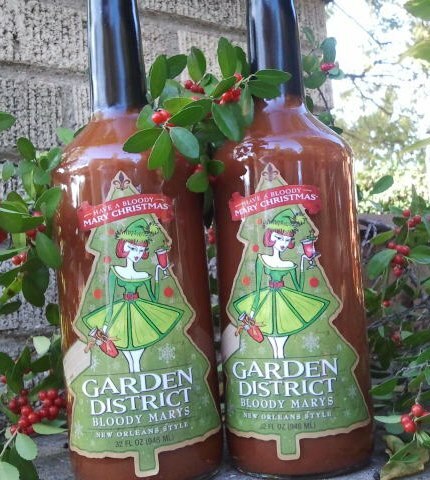 I’ve been working with Garden District Bloody Marys for several years now. 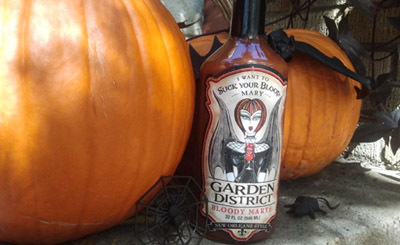 This year we created new labels for Christmas and Halloween. 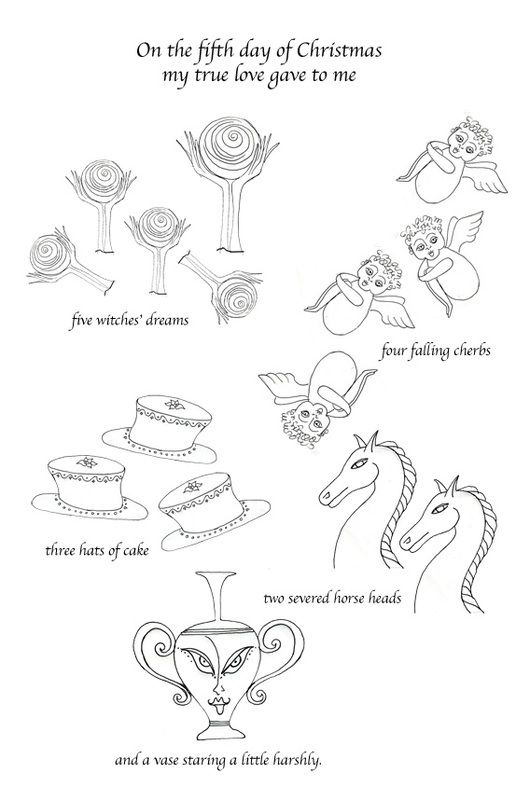 Graphic designer John Harrell made my illustrations shine! Last year I helped David and Melissa Loder create their fantasy holiday yard display by designing a sleigh, Santa’s garage, signpost and a forest of trees, all based on their ideas. This year a locomotive was added. I put their ideas on paper, but they did all the heavy-lifting. I haven’t seen the train live yet, but it toots and blows steam! 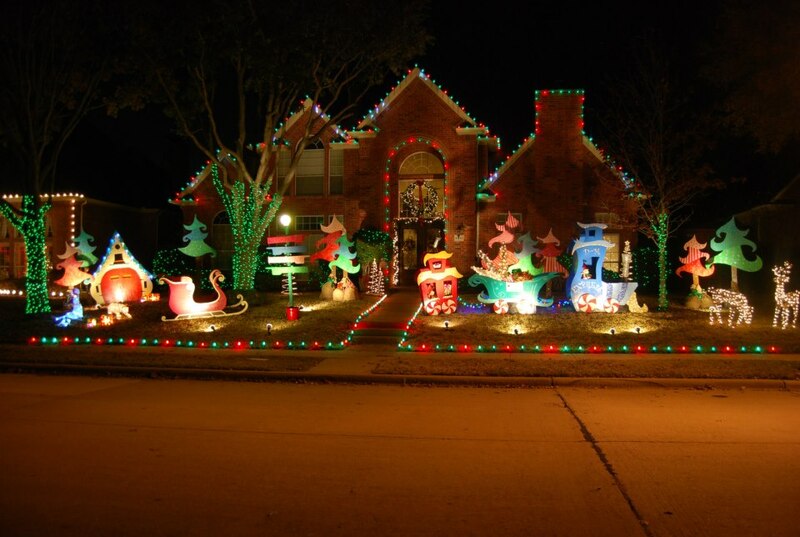 Their exhaustive efforts got them a slot on the Dallas Morning News Weekend Guide’s list of top holiday displays in DFW. I traditionally do a Halloween illustration every year, but this year my time was spent on a different kind of art project. My artist friends, The Brians (who are pretty much local celebs in my part of town) have an annual Halloween bash that is truly something to behold. The first time I went I was amazed to see so many fully grown adults in fully realized costumes. Lots of the guests are artists or have creative inclinations and The Brians party is a yearly opportunity to really cut loose. But the effort was worth it. I love them! Now I’m thinking about Christmas/Festivus dread falls. Stay tuned. And have a Happy Halloween! Books are one of the great loves of my life. There was a time when I would have thought that “altering” a book would be the same as desecrating it. No longer. Creating a new work of art with an abandoned book as its skeleton seems to me to be a loving and creative way to give new life to a book destined for the shredder. I made my first altered book for SparepARTS, a silent auction hosted by the Fort Worth Avenue Development Group to raise money for public art installations in West Dallas. (Picture above is a double-spread in progress). FWADG was my West Dallas community partner for the Parade of Giants earlier this year in March. 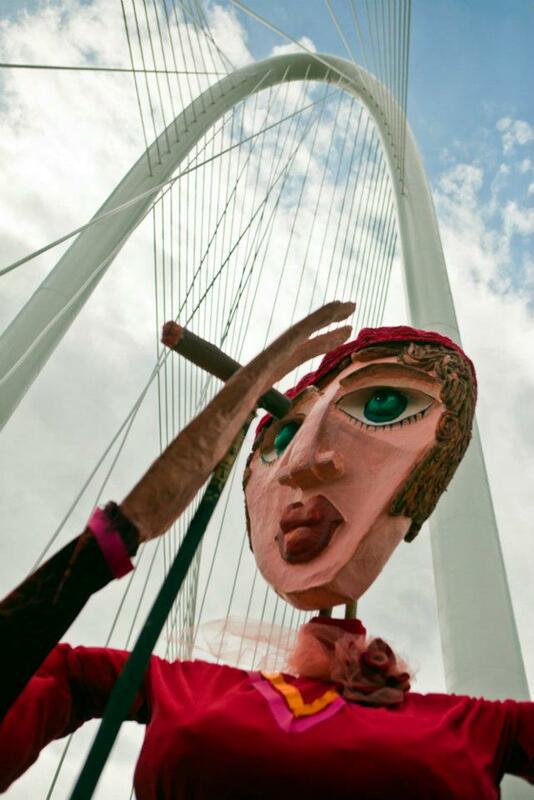 Without their help, I wouldn’t have been able to create the fabulous giant puppet of Bonnie Parker, so I was happy to contribute to their cause. Bonus: I got to make this pretty awesome artwork. 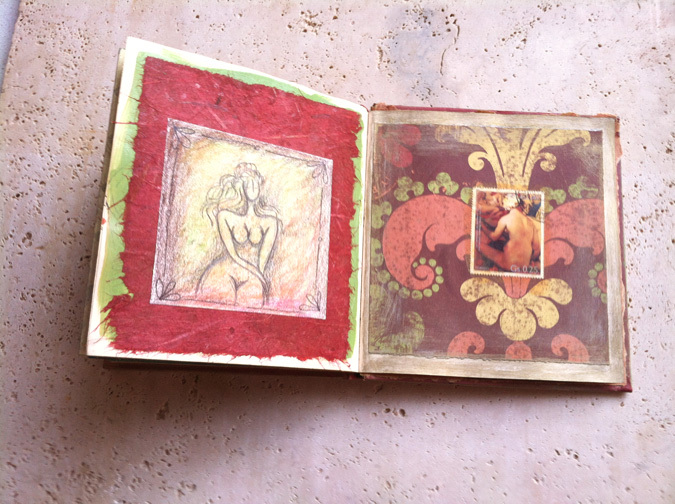 Making an altered book is great fun. Do it! Above photo is one of the completed double-spreads from my altered book, “Flesh and a few Fish”. You can see more of the works-in-progress here. Click here to see images of the finished book.